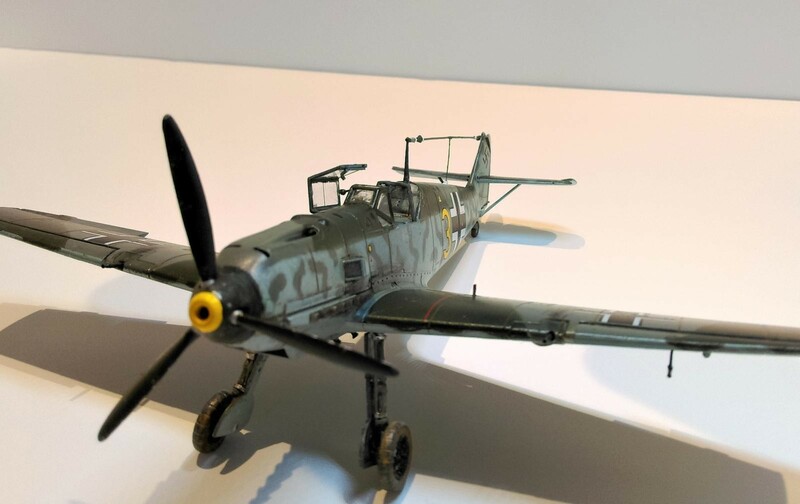 My last post showed images of the Airfix 1:48 Scale Messerschmitt Bf 109 E-4/B that I’d finished at the end of 2018. 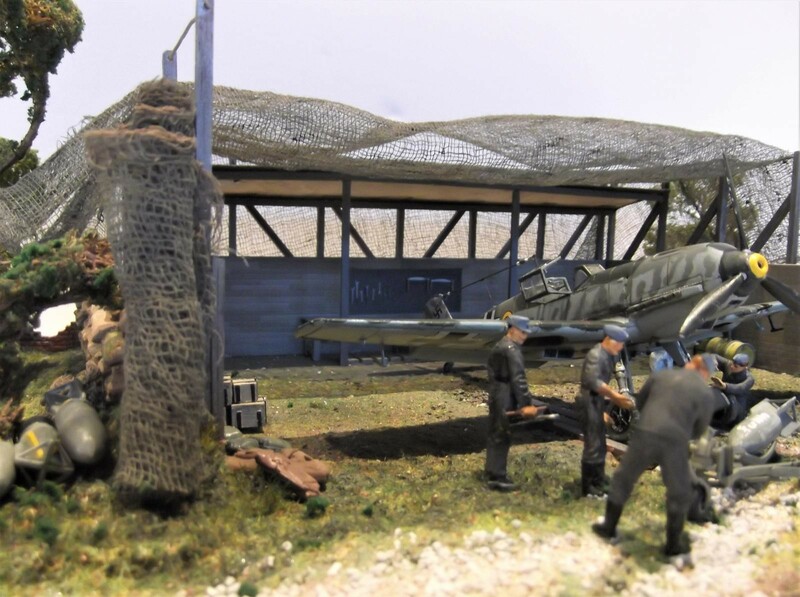 This was modelled along the lines of Yellow 3 in which Leutnant Horst Marx was shot down near Tunbridge Wells in the early evening of Black Thursday – 15 August 1940. 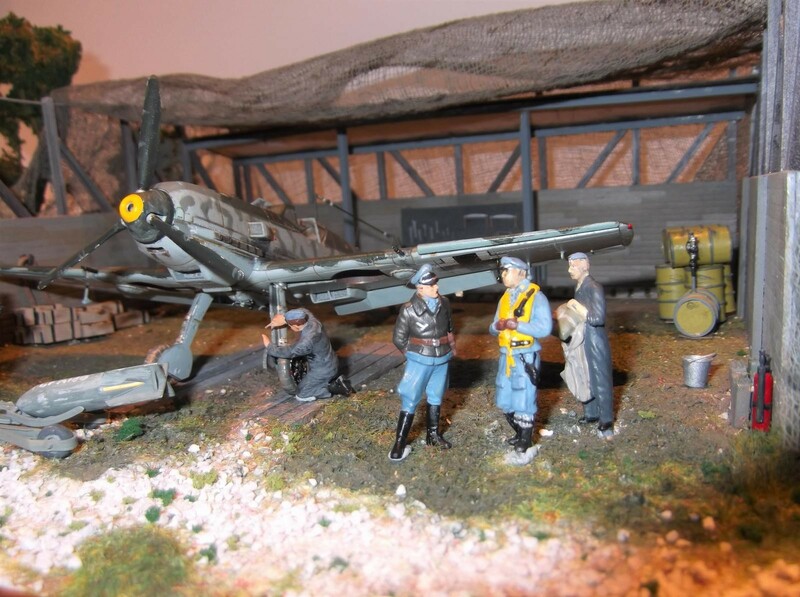 I’d made the model to partially satisfy my interest in the German fighter-bomber unit, Erpobungsgruppe 210 which pioneered fighter-bomber tactics at the time. Erpro 210 operated mainly Messerschmitt Bf 110 fighter-bombers, but also had a complement of Bf 109 fighter-bombers which made up the units 3rd Staffel. 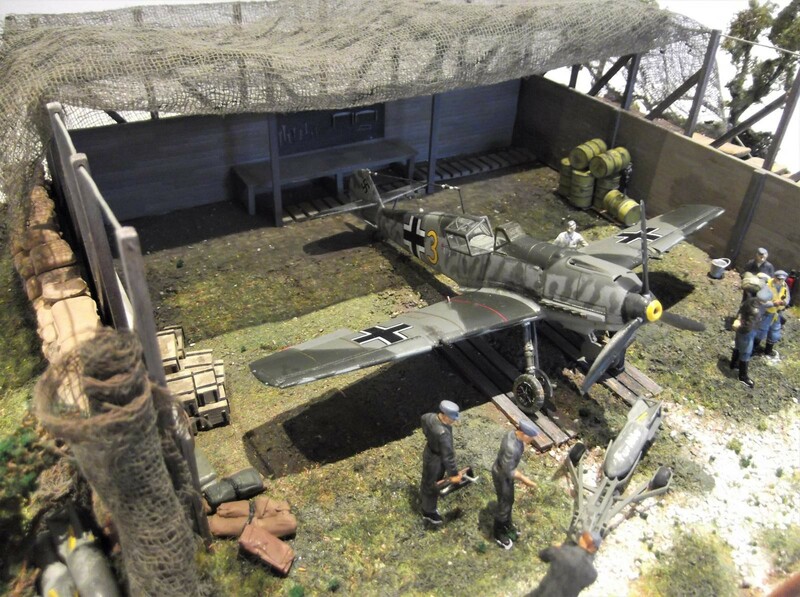 This diorama is based around the image of a typical camouflaged revetment used by the Jagdwaffe in Norther France at the time of the Battle of Britain. Erpro 210 at this time were using Calais Marck as their forward air base for strikes against convoys and British coastal facilities so I decided to recycle the basic structure I’d created some time back to represent The preparations around Yellow 3 during the late afternoon of 15 October, with the “black men” tinkering with last minute adjustments as they brought up the 250 kg bomb that Horst Marx would carry on his last war flight. In addition to the structure of the earlier diorama, I decided to fold back some of the camouflage netting canopy to make the contents within the revetment a bit more visible. 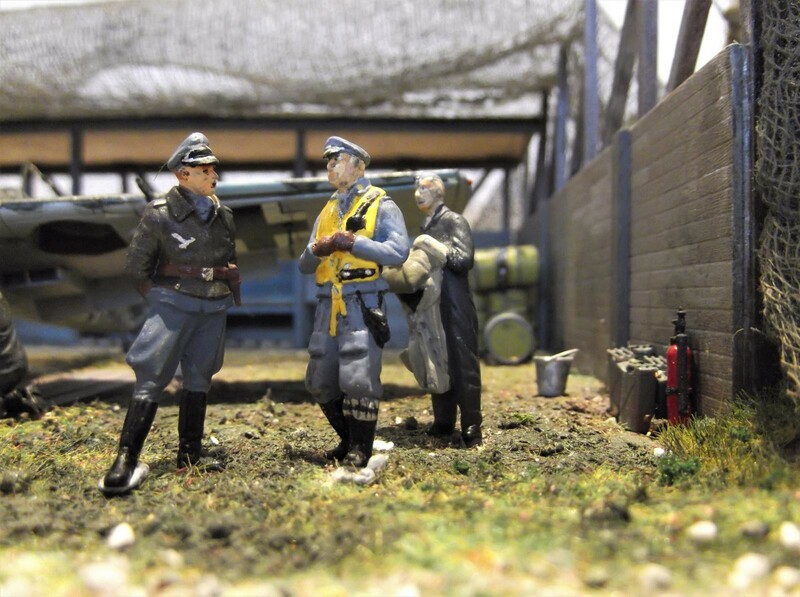 With the model of Yellow 3 as the centrepiece, I spent some weeks of regularly interrupted detail work, manipulating some additional figures from a Revell Luftwaffe Pilots and Ground Crew kit to add interest. 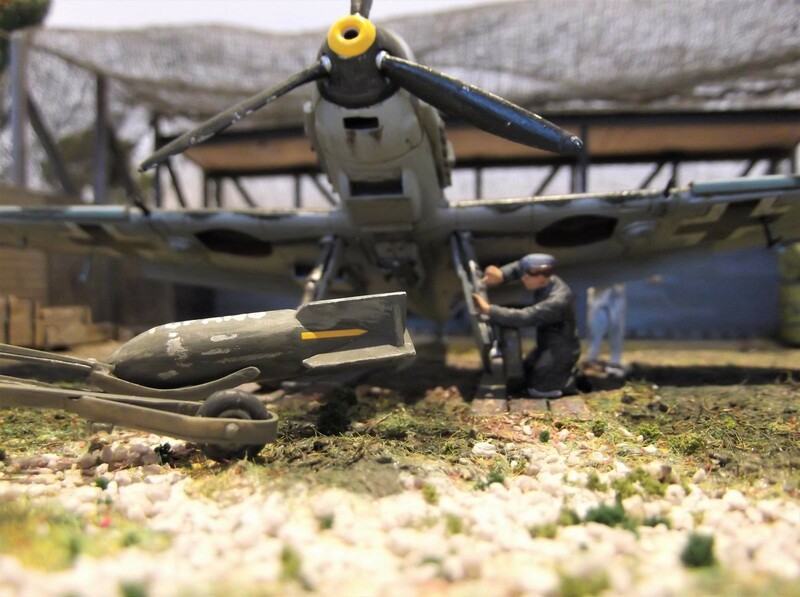 I can’t say I’m too impressed with my skill at painting the figures realistically but, as a whole, they give a reasonable impression of the bombing-up process before a sortie, adding a bit of life to the sometimes sterile pictures of completed models. I’m not sure how often I’m likely to attempt other dioramas, but I think this one works quite well and the pictures don’t show too much of the hash I made of scratch-building the trees that would have been the natural camouflage for this type of revetment. Yellow 3 is an interesting aircraft, not just because it pre–dated the yellow or white cowlings that typified Jagdwaffe fighters in the BoB late in August/September, but also because it showed the unique style that 3/ Erpro 210 used to tone down the RLM 65 colours of the fuselage and fin areas. 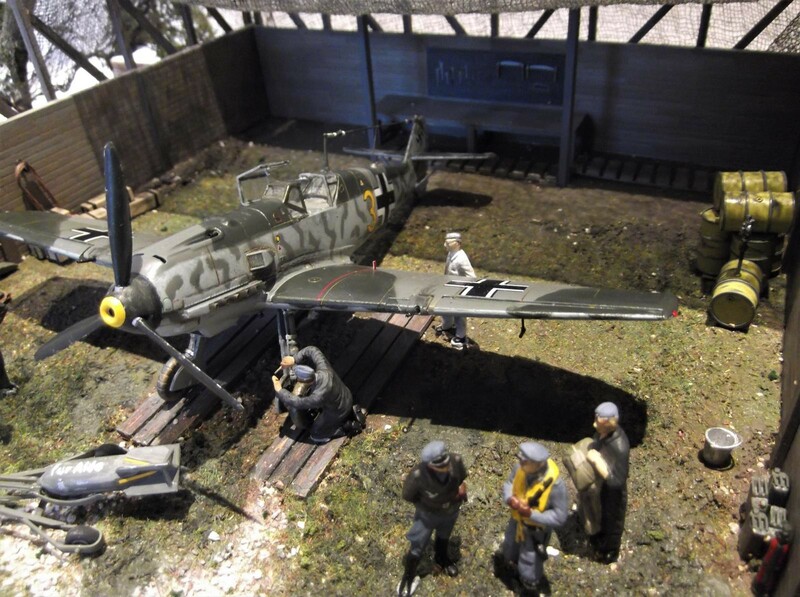 The other interesting factor is that when the aircraft was abandoned by Leutnent Marx over Tunbridge Wells, it crashed and completely disintegrated near Frant in Sussex, denying RAF Intelligence the opportunity to examine the first Bf 109 fighter-bomber to crash within the British Isles. It wasn’t until much later in September that this became possible when another such aircraft was brought down with enough left to identify the new role that was being undertaken by this dangerous fighter. Apologies to all who don’t share my interest in Erpro 210 and in particular Horst Marx’ last mount. It’s obvious a lot of thought and effort went into creating this beautifully done scene. It turned out very nicely indeed. Great work! 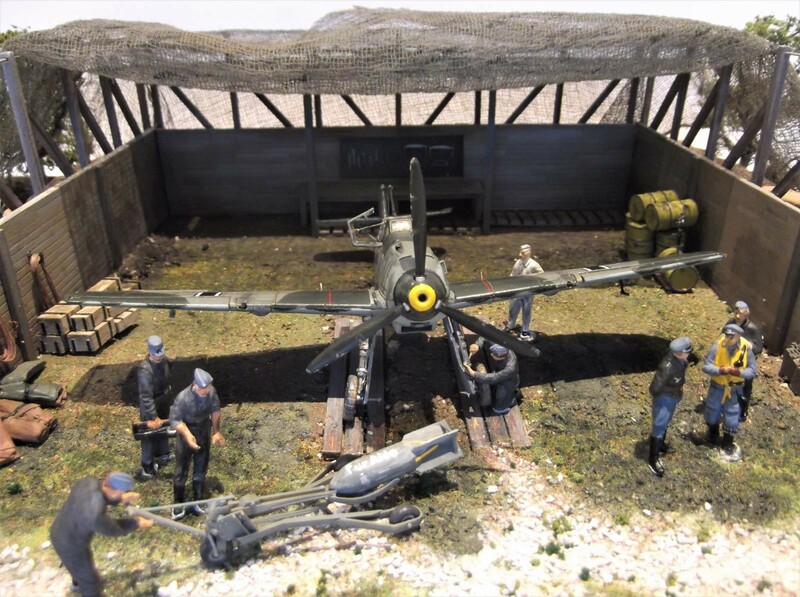 A great build and diorama! Very good work! I like this. 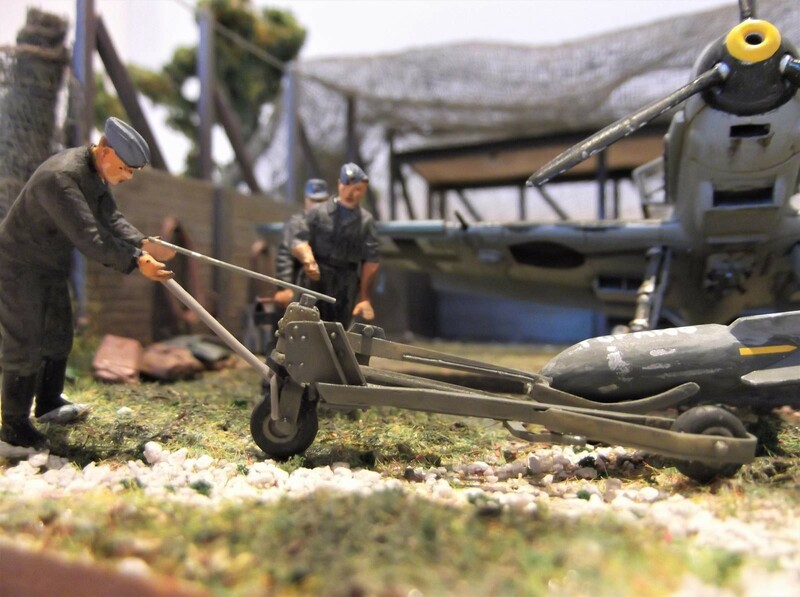 What an interesting diorama Paul, I like this very much, It looks so real. Nice job. Nice work – solid visual interest. Well done! I really like this, Paul. Not least for the history behind it. I think you are spot on about the interest that some judiciously chosen figures in a nicely designed snapshot of the action can produce. Well done on the whole concept – the 109 is lovely – the dio brings it completely to life!